The whole thing is well done; each small detail reverberates and accentuates its part of the larger composition. The main group of shapes draws in the eye right away, and then your eyes go back and forth to take in the bird, the ghostly small images off to either side, and of course the bright blue splashes that so well contrast the black and turn it into a triumph instead of a study in grim shades of darkness. Do you have a degree in design? You mentioned Illustrator. You have a good eye for design, I'd say, at least in this piece. That's a very impressive piece, very well done. 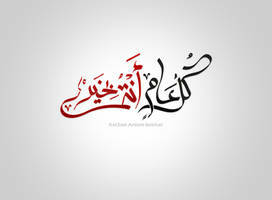 Can you please tell me where can I find free downloadable Arabic Calligraphy fonts? I need it for a project. The problem with hand-drawn calligraphy is that I have to use Ai or PS to make it into a proper logo and I don't have the skills for that. Could you please help? Thank you & جزاك الله خيرا in advance. What does this say or mean? Well studied and well done. جميل .. ممكن تقولي ايه المكتوب؟! did u choose any fonts or it's a brush ?? if it was a font, from where do u download arabic fonts ?? Could you please tell what is written in this work? It is awesome.. Could you please tell us "What is written there in Arabic"? i like those blue details, nice touch, balanced. even your signature fits in really good! this is piece of art so beautiful..